Bring the whole family and your camera and check out these magnificent light displays this holiday season. It’s the most wonderful time of the year – and it’s also time to flex those Instagram skills and see light shows in and around D.C.
From now through January 1, you can see the National Zoo in a new light – literally. Every night, the entire zoo is illuminated with colorful light displays using 500,000 environmentally friendly LED lights. The event is completely free and you can sip hot cocoa as you and the kids enjoy music-coordinated light shows. You can even go on a train ride around the zoo aboard the National Zoo Choo-Choo. 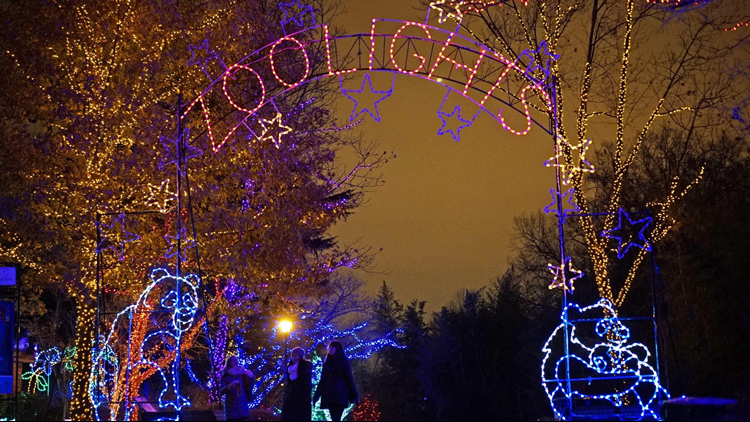 Once you get your best Insta (we’d recommend with one of the colorful panda lights or right at the entrance under the illuminated ZOOLIGHTS sign), be sure to hashtag it with #DCZooLights. Embrace public art from December 1 through January 6 in historic Georgetown. For the fifth year, artists from all over the world will be bringing public art displays full of color and light to Georgetown. Support local artist Robin Bell whose “Faces and Places” exhibit will be located at the BB&T building and will feature people and places around Georgetown. GLOW offers several different walking doors, from a history-focused pay-what-you-want tour to a photography-focused “photo safari” tour, if you’re willing to cough up $79 to take that perfect nighttime photograph along Washington Photo Safari Director E. David Luria. Don’t forget to hashtag #GeorgetownGlow. In the Hampden neighborhood of Baltimore, 34th Street will be lit up from now through January 1. Take a stroll down the brightly-lit street, where each and every home embraces the 72-year-old tradition, which began the same year as the release of iconic movie Miracle on 34th Street. We recommend you pick a display that speaks to you the most and enjoy the colorful sights. If you’ve ever been curious about the magnificent-looking Church of Jesus Christ of Latter-day Saints in Kensington, Maryland, now is your chance to see it aglow from November 29 through January 1. The temple grounds will have 650,000 lights. In addition to the light show, there will be nightly performances, from international choirs to dancing. During the holiday season, the Wharf comes alive: Ice skating, a fire pit, and the Waterfront Wine & Beer Garden can warm the whole family up. On December 1, settle in for a magnificent boat parade where people can show off their decorated boats. A fireworks show will follow. Morph your love of plants and love of light displays into one and you’ve got the Winter Walk of Lights at Meadowlark Botanical Gardens in Vienna, Virginia. The lights display is a half-mile of animated light displays running through now to January 6. Grab a hot cider or hot cocoa from the Garden Patio and hit up the Fountain of Lights for a picture. Don’t forget to pick up your own s’mores kit and roast some marshmallows while you’re there. Tickets can be purchased here. Enjoy the light show without leaving the warmth of your car at the Symphony of Lights drive through at Howard County General Hospital. It’s $20 per car to drive through the display made up of 300,000 bulbs. All proceeds go to the hospital.